Pain Detox Center - Drug Testing For more information please do not hesitate to email us. For more information please do not hesitate to email us. Redwood Toxicology Laboratory's objective is to help its clients detect and prevent drug and alcohol abuse. Urine drug testing through RTL is legally defensible, affordable and convenient. RTL screens urine specimens by enzyme immunoassay (EIA). Drug test confirmations are available by thin layer chromatography (TLC), radioimmunoassay (RIA), gas chromatography (GC), gas chromatography/mass spectrometry (GC/MS) and liquid chromatography/mass spectrometry/mass spectrometry (LC/MS/MS). 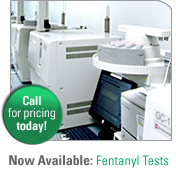 Each drug screen and drug test confirmation is performed on state of the art equipment by experienced staff. The analytical methods used by RTL for the detection of drugs of abuse are scientifically accepted and approved by the U.S. Department of Health and Human Services. ARE THEY DRINKING? WE'LL FIND OUT. RTL offers ethyl glucuronide (EtG) and ethyl sulfate (EtS) testing, known as the EtG/EtS Alcohol Testing solution. EtG is a direct metabolite of alcohol (ethanol). Its presence in urine may be used to detect recent alcohol ingestion, even after ethanol is no longer measurable. The presence of EtG in urine is an indicator that alcohol was ingested. 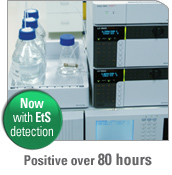 EtG is detectable in urine for up to 80 hours after the consumption of alcohol. EtG is only evident when alcohol is ingested and is not produced as a result of fermentation. In addition to EtG, recent scientific studies have identified ethyl sulfate (EtS) as a second specific metabolite or biomarker of ethanol. For this reason, RTL tests and reports EtS, in conjunction with EtG, to confirm recent ethanol ingestion or exposure. The detection of EtG and EtS offers greater sensitivity and accuracy for determination of recent alcohol ingestion, than by detection of either biomarker alone. The RTL drug testing lab utilizes the most sophisticated, sensitive and specific equipment and technology available, LC/MS/MS (liquid chromatography/mass spectrometry/mass spectrometry), to screen confirm and quantitate EtG/EtS. This methodology provides highly accurate alcohol test results.